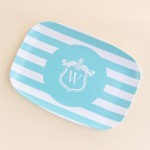 Serve in style with a durable melamine platter with a durable melamine plate with a personalized touch! Emily Ley's Navy Dot pattern is the border of the plate with a turquoise center waving banner for a personalized message. Platter is dishwasher safe, but do not microwave.